Here it is, another Mason Jar Craft lol! Imagine that! This time I am making salt & pepper shakers for the back deck! I have seen similar all over the place and thought it would be nice to have some for the back yard! I started out by marking an “S” and a “P” on the lids of my jars with a Sharpie marker, as you can see in the above picture. 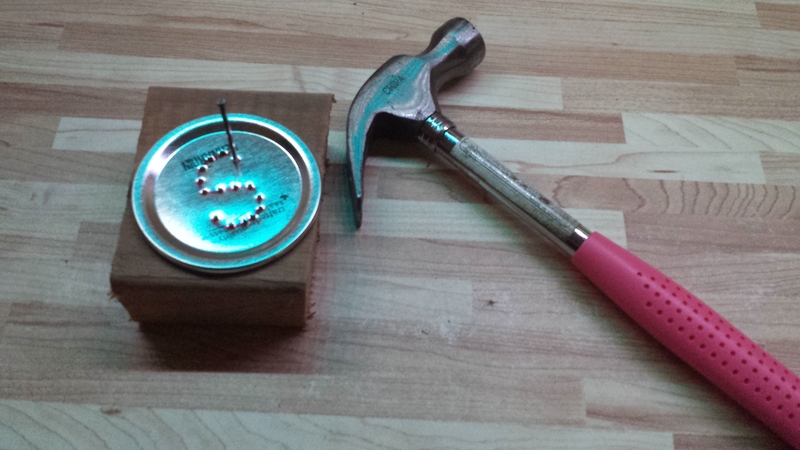 Next I used my pretty pink hammer, a nail and a little block of 2 x 4 to make the holes in my lids. 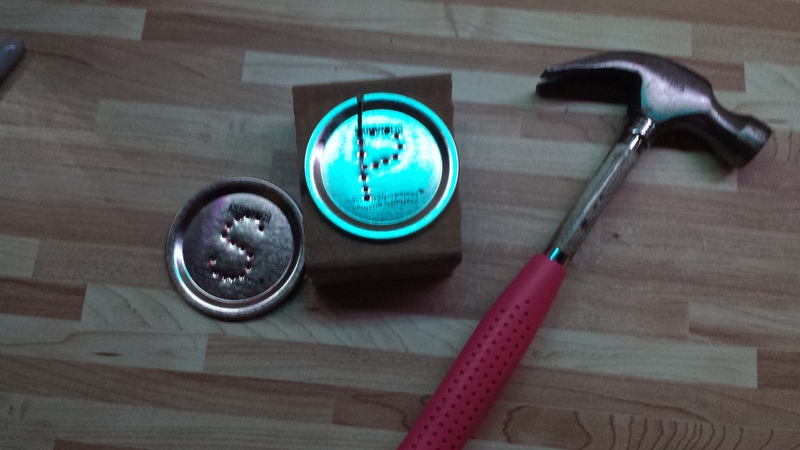 I just lined up the nail along the lines of the letters and gave it a little tap, just enough to go through the lid and into the wood. 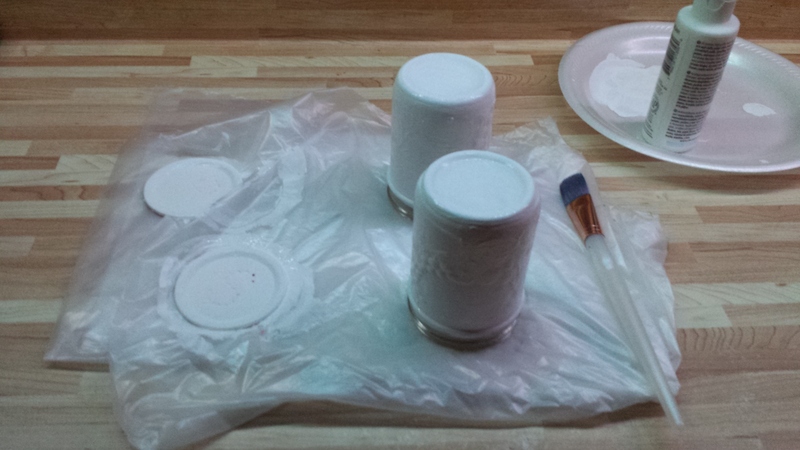 Now it was time to base paint the jars. I also decided to put a coat of paint over the lids. I hadn’t decided at that point if I was going to paint anything on the lids but I still wanted them painted. I just base painted white. I was thinking I might like to try to do an ombre effect in colours that will match the cushions and such outside. Our cushions are brown, white and orange so I used variations of those colours to do the ombre. I think the most important part to doing the ombre is to keep the paint wet enough to blend between the colours. You start by painting a stripe of paint around the jar, where you want the colour placement to be and adding a bit of water to your brush, keep going over the transition between the two colours until you can’t see the line between them. I did white, beige, orange and brown, going from light at the top to the brown at the bottom of the jar. All the jars themselves need now is a few coats of sealer and then it’s on to the lid! I decided to just paint a little flower on the lids of the salt & pepper shakers and then put a few coats of sealer on those as well. You might find the holes fill in with the sealer. All I did after was to push the same nail through the holes once it was dry to reopen them and added a little bow with twine! And here are my Mason Jar Salt & Pepper Shakers, all ready for backyard meals! 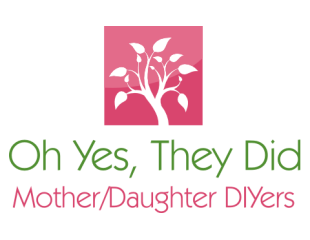 This entry was posted in Crafts, informative, Our Posts, painting and tagged mason jar crafts, ombre paint effect, painted crafts, postaday. Bookmark the permalink. Very cute! I like your idea of the S & P on top!